It's been a few months since I wrote for this site. I've got a couple of articles planned explaining what I've been up to, but I thought I'd jump straight back in with a report from the Vitruvian last weekend. 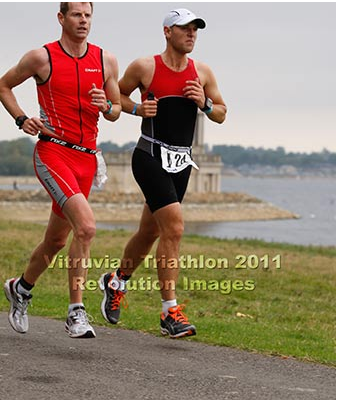 The Vit was my first 'breakthrough' race back in 2005, the first race where I felt like my result showed that I had some potential in triathlon. That day, after a 39 min swim, I posted a 2.27 on the bike and 1.29 on the run to come in on 4.38 overall. That day, I was shooting for a sub-5, and considered anything sub 4.45 as pretty much superhuman - needless to say I realised that my goals would need to be reset after that race! Going into this years race, I found myself with very low performance expectations. Having taken May, June and July almost completely off training (no swimming or cycling at all, a couple of weekly runs) I figured that it would be pretty unwise to set any time goals. I plan to talk more about my 'training break' in next week's piece, but with only 4 weeks of riding in my legs, and having completed one swim session during each of those 4 weeks, I hit the start line with the aim of enjoying the day - and that meant being able to conserve enough to run an enjoyable half marathon rather than a painful shuffle! Time-wise, I figured that I was probably going to be somewhere around 38 mins on the swim, 2.35-2.40 on the bike, and 1.35-1.40 on the run, depending on how my legs held out - so in my head I had a 4.50 as a 'best case' scenario. Raceday morning greeted us with beautiful blue skies and a little wind, and was quite warm. I figured that being out of shape would give me a little freedom to try something different, and I started the swim on the right hand side on the second row of swimmers, planning to get stuck in and find some feet to drag me round. Usually, I start on the inside of the course and try to swim in clear water to the first bouy. I lined up behind Rich Hunt, who I know is a decent sub-30 swimmer, and figured that if nothing else I'd get dragged off the line by him. Turned out to be a pretty good call - I felt a good tow for the first couple of hundred meters and felt pretty comfortable in the middle of a big pack. As I expected I lost his feet relatively quickly, but by then I was right in the middle of the pack and was getting towed along nicely. I felt comfortable, breathing mostly bilaterally, and with pretty good feet most of the way. I completed the first loop with 17.00 showing on my watch and was chuffed - I knew the second lap would be slower with mostly clear water, but I was still on for a decent swim. On the back straight I looked up to sight and could clearly see my pal Matt Rushbrook about 30m ahead with his distinctive yellow seams on his blueseventy wetsuit and was pleased with this, as we'd trained together in open water a few weeks earlier and he'd been much stronger than me then - another little positive mental feeling passed through me. I smiled to myself that it would be great to catch him, but figured the effort to do that would probably kill me for the rest of the race! Just then, while breathing to my left, I noticed the lead kayak of the wave behind us coming by me - followed by a torpedo of a lead swimmer just on my left. I know enough about drafting to recognise that I was never going to hold those feet, but wondered if a few more guys came by going a bit slower it might give me a chance ... sure enough a minute or so later, a pack of three or four guys came up next to me and I thought, why not, you only live once. So I started to pull hard and figured I could do a max effort for a couple of minutes without hurting the rest of my day. The boys were really shifting, and even with my max effort I was only just holding the feet of the last of them, but after a minute they had pulled me all the way to Matt’s feet just as we reached the last bouy! The momentum from this carried me past him and I managed to exit the water about 30 seconds up on him, with 35.30 showing on my watch. Game on! I felt great on the bike and knew that the course suited me. Lots of long, flat TT sections, some nasty rollers and a couple of hills that break any packs up. I figured that Matt would ride past me immediately, but it was 30 minutes before he caught me, and I figured that that I was going to have a pretty good day. We’d ridden a solid TT bike session together a few weeks earlier, and he had just crushed me during the intervals (and any time the road went uphill!) and I figured that would be the last time I would see him all day, especially given the speed that he passed me at! Onto the rollers, and my usual strategy of holding back on the hills wasn’t helped by the fact I couldn’t shift to the little ring! So big ring all the way it was going to have to be. I'd had a short chat with Hywel Davies at the swim start and smiled to myself that he would approve at least! I still had a 25 on the back so it wasn’t that bad, but it meant I was a bit wary of pushing up the hills, as 53 x 25 isn’t a great ratio for anything other than breaking a chain, so most of the time I limited myself to getting out of the saddle in the 23 or 21. Still, I was riding within myself on the uphills, listening to my breathing, yet still reeling people in and passing them. As I racked my bike, I heard the announcer call Matt’s name leaving transition, so again that was another little positive confidence builder. I knew there would be no chance of catching him on the run but I felt like I’d had a good swim and bike – now it was just left to see how the legs would react on the run! I eased into it, determined not to run off too fast. It’s extremely difficult to run slowly straight out of transition, but I managed it here, getting passed by three guys almost immediately like I was standing still. I went past the first 1km marker in 4.30 and thought that if I could hold that pace to the finish, it would put me somewhere around 1.35. Interestingly, I ran past two of those three guys within the next km – interesting to learn about pacing by watching the mistakes of others. I ticked off the miles, passing the end of the first loop in exactly 47.00 but with tiring legs – figuring that if I could hold out for a 1.35 I would have done well. However, after a couple of caffeinated gels I started to feel great and really started to pick it up. I had no soreness in my legs at all and felt like I could run hard to the finish. All my worries about not having the endurance to get to the finish evaporated, and with an hour showing on my watch, I knew that I could run hard for the next 30 minutes and get to the finish safely. The mental aspect of being able to run strongly at the end means that you’re going well when others are suffering – and it all feeds the confidence in a positive spiral. One of Gordo’s great phrases is ‘Go fast when the race is slow’ and that was my mantra as I was picking people off. I was feeding mentally off their weaknesses – looking at tired runners with deteriorating form, I was constantly telling myself ‘shoulders relaxed, hands high, knees high’ – and with every tired runner I passed I was determined to hold my form together. In fact, the photo from the race is only a couple of km from the finish and I’m really pleased with how my form looks in it – especially as it’s not often you see both feet off the floor at the end of a long race! I crossed the line with a run split of 1.33.04, with 47 for the first lap and 46 for the second, the first time I’ve managed to negative split a HIM run. Last time, it was 42/47 for the 1.29, so I think this might rank as my best ever run, relative to fitness. Matt was about 3 minutes ahead of me at the end - both of us really happy with our performances, and both of us in a bit of state and needing to be helped into chairs by volunteers afterwards! Overall, I was over the line in 4.37.40, faster than my 'best case scenario' prediction time by over 12 minutes, and even beating my overall time from 2005 in the process. To be honest I'm quite surprised that I managed to go that fast off four weeks of training - it's been a real lesson in not placing limits on what I think I can do.